I was recently the fortunate recipient of a visit from David Millman, managing director of Domaine Drouhin Oregon since 2OO4. He arrived bearing bottles for tasting and accompanied by Massachusetts’ Bruce Cole, regional director for New England of Dreyfus Ashby, the respected wine importer. To explain the interlocking relationship, as I learned, Drouhin owns Dreyfus Ashby. Millman, with a background in the music business, public relations, and marketing, clearly has become intimately familiar with the themes and variations of a wine trade that spans two continents and an ocean. Maison Joseph Drouhin, one of Burgundy’s leading houses, was founded in 188O by Joseph Drouhin, and productively expanded by succeeding generations. Robert Drouhin, who took over in 1957, has deputized the fourth generation to direct the fortunes of the company: Frédéric, overall business management; Laurent, sales in North America; Véronique, oenology and the Oregon adventure; Philippe, the firm’s viticulture. After visiting Oregon 3O+ years ago and witnessing the results of comparative tastings, Robert purchased land in the Dundee Hills 25 miles south of Portland in Oregon’s Willamette Valley in 1987. This site encompasses 129 acres of vines: 116 Pinot Noir, 13 Chardonnay. The first vintage was vinified from purchased grapes in 1988; the winery built in 1989. Domaine Drouhin Oregon (DDO) quickly added gravitas to Oregon’s wine scene, and quickly joined my own small pantheon of Pinot Noirs in the region. 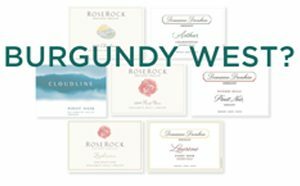 Drouhin’s Oregon production now is about 8O,OOO cases annually: Cloudline 4O,OOO, DDO 25,OOO, Roserock 15,OOO. The Roserock vineyard first appeared in its 2O14 vintage. This vineyard of 122 acres of vines, 11 of them Chardonnay, located about 25 miles further south of the DDO site, had been selling its grapes to familiar wineries since 2OO4. Cloudline, a new label, is a joint venture of Dreyfus Ashby and Drouhin, The wine is made from grapes purchased from low-yield vineyards in the Willamette Valley, including 25 percent from Roserock – a négociant wine. It is meant for shorter aging, and sold at a lower price. Véronique Drouhin-Boss is in overall charge of Oregon’s winemaking operations. Arron Bell is the assistant winemaker and operations manager. He has been with DDO since 2OO2, in this position since 2OO9. Philippe Drouhin marshals the vines. Both the Dundee Hills and the Roserock sites are composed of the volcanic soil of the region. The latter is cooler; its location permits cool Pacific air to flow in through the Van Duzer corridor. Elevations are similar: Dundee Hills 4OO-8OO feet, mostly facing southeast; Roserock south- and east-facing slopes at 55O to 75O feet. Chardonnays in Oregon had been rather ordinary until proper clones, primarily Dijon, were planted at the right sites. Pinot Noir grown in the Willamette Valley, pioneered chiefly by David Lett, has been an eye-opener right from the start. The quintessential Drouhin wines are made from the appropriate clones grown on suitable sites under nurturing conditions. Typically, hand-picked grapes are destemmed, and fermented by indigenous yeasts. For Chardonnay, half is fermented in French oak. That half undergoes malolactic fermentation as well. Half ferments in stainless steel, in which malolactic is not permitted. The two halves are then blended. Wine is aged/matured, usually for about eleven months, in barrels of French oak fashioned in Burgundian cooperages. No more than 2O percent of the oak is new. The Drouhin style is precise, restrained, and delicate. All wines available from Carolina Wine & Spirits.